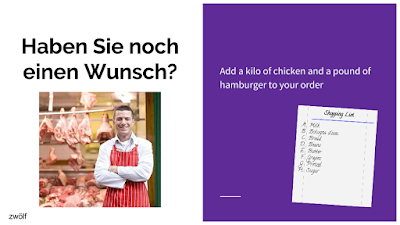 I've been teaching German for seven years now. I still feel like a newbie--a rookie teacher grasping for the best way to teach and assess my students. When I began teaching I had the idea that oral tests were the way to go. 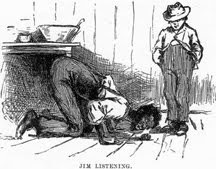 The initial goal of language learning is communicating, and oral tests were the most realistic ways to assess communications. 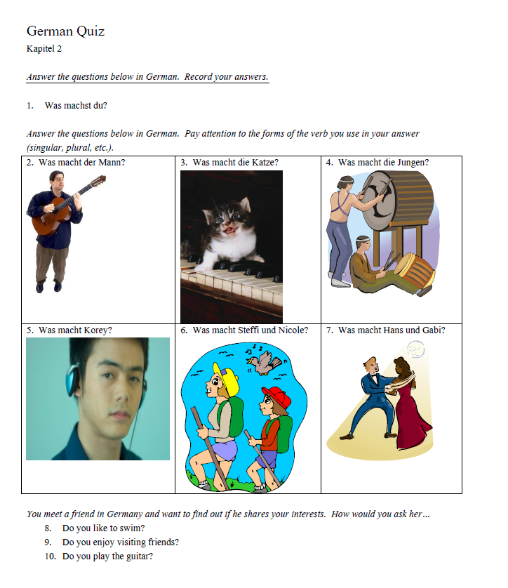 Here's a look at an early quiz from 2007, my first year teaching German. It's only ten questions long--long enough, though. It took me a full, 90-minute block to have all kids complete the assignment on a single, classroom computer. After about two years, I abandoned the oral quizzes as too unwieldy and relied on testing by the book. Assessment was easier for me--easier to grade, easier to teach to--but it wasn't authentic. I didn't get the impression that my students could walk away from the test and have a similar conversation in the real world. This year I moved from following the book to a more theme-based approach to teaching. This meant that I would need to reconfigure assessment, too. First, I moved assessment from the document approach to a more interactive approach, using Google Slides. This allowed me to include graphics and come closer to the kinds of conversations that are natural with native speakers. This gave students a chance to interact with a person, as seen in this first slide, below. The test began with a conversation students might have with their grandmother. Of course, we had covered greetings early in German 1, but this is a great way to start a test with a question that is natural. The second question came from the current chapter. When I began with this year's oral testing, I had a thought that students would look at the screen and speak the answers naturally. They didn't. Instead, they asked for paper to write their answers on (they could have written them in Google Docs, but I don't want to see extra windows open during testing for fear of cheating). This step, originated by the students, extended the amount of time I needed for testing, but it provided me with both written and oral proof of students' abilities. In other words, it was a win-win. Students turn in their written test at the end of class, which gives me a back-up in case I can't hear their recordings, or if I'm not sure from their pronunciation whether their answer was correct or not. In the slides themselves, students are performing basic, common-sense tasks. 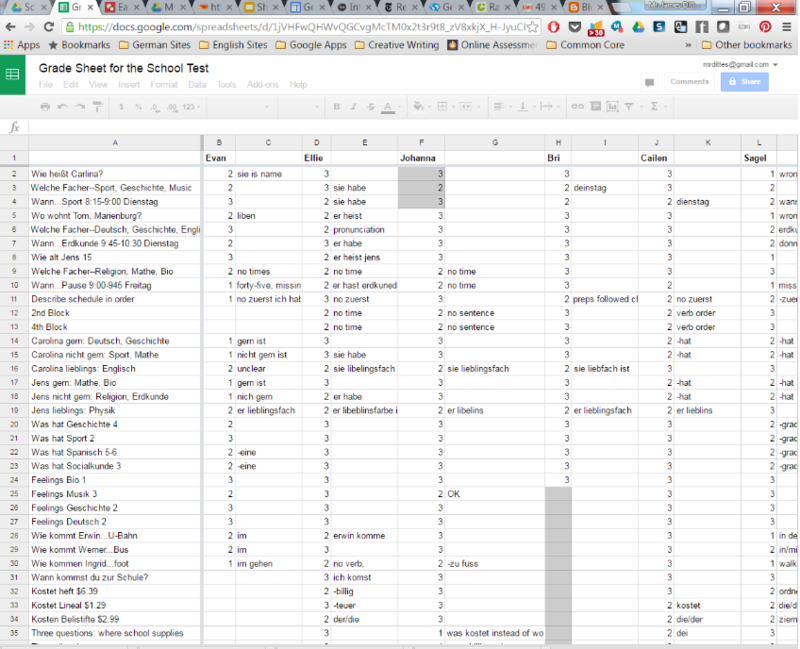 Since the test covered shopping in different German geschäfte or shops, students were given a list. 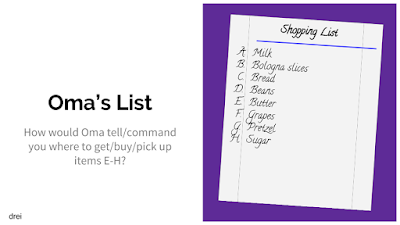 You will note that the list is written in English. One important aspect of testing is that all answers (except greetings, please and thanks) are expected to be given in complete sentences. This shows that students haven't just memorized the translations of the words, they can also use them in sentences with appropriate grammar, a key higher-level language skill. 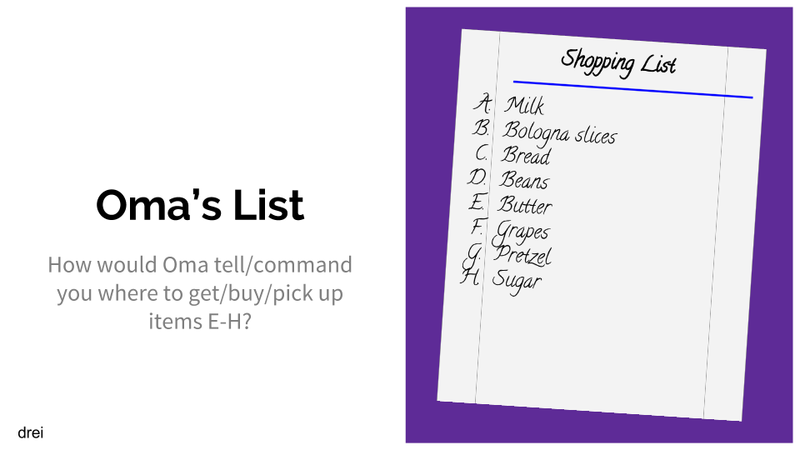 Once students were out on their mission to purchase the items on their grandmothers' list, everything fell into place. 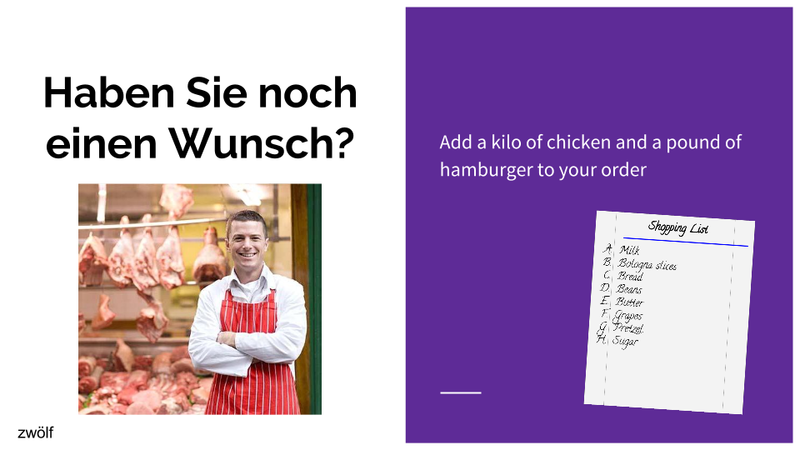 The slide below shows a friendly butcher, asking a question in German, enhancing the real-life nature of the interaction. 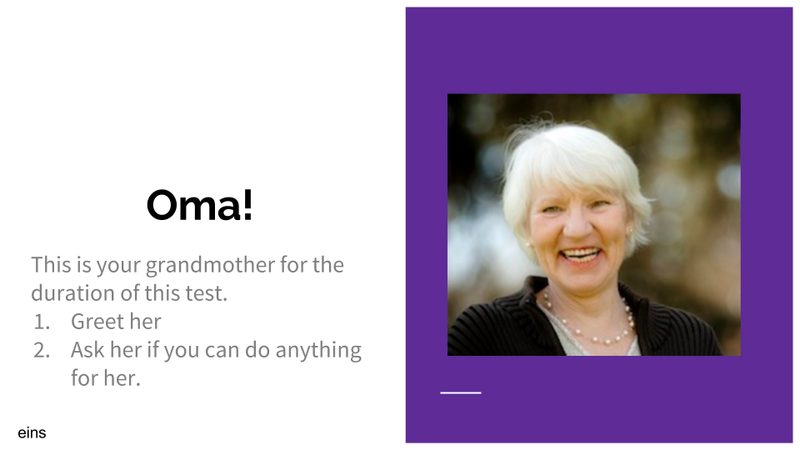 The most recent test had 20 slides with one or two questions per slide. It took the whole 90-minute block to complete, and I would recommend 15-20 questions for a quality assessment, which is far fewer than the 40 or so on a typical reading/ writing/ multiple choice test. Over two years, I have built up a collection of mic/headphones for students to use in testing. Students use the online app, Vocaroo, to record their responses, then they paste the links to their conversations as comments on my web site. When I go to grade the tests, I will listen to each recording and record the answers on a spreadsheet, noting any mistakes, that I can go over with students when we review the test. 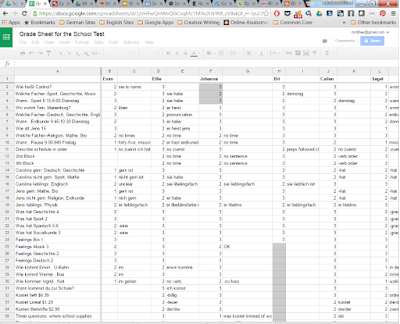 Here's a peek at a grading sheet from last semester. I have a possibility of three points for each answer, and I record notes for any mistakes. This is a review of Oral Testing in my German Class. 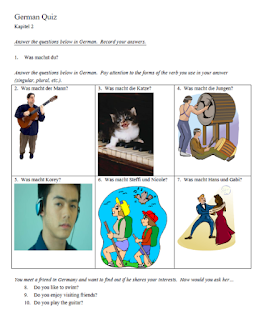 It's great for classrooms that have access to technology for students, and I think it is the most authentic type of assessment that I have yet tried out on a class of German-language learners.